Yesterday afternoon Dave Little invited me to go for a drive out of town in search of some Tarpon in the local flood waters. With the creeks too dirty to fish it seemed like a top idea. We headed off about 2pm with anticipations of some good fishing. At our first destination the tarpon were rising in good numbers, but they appeared to be mainly small fish. It took a few casts, but finally both Dave and I hooked up...simultaneously! Slightly better fish they put up a great fight, especially for Dave who was fishing with his brand new 7foot 4wt fly rod! A couple of quick pics and the fish were on their way. 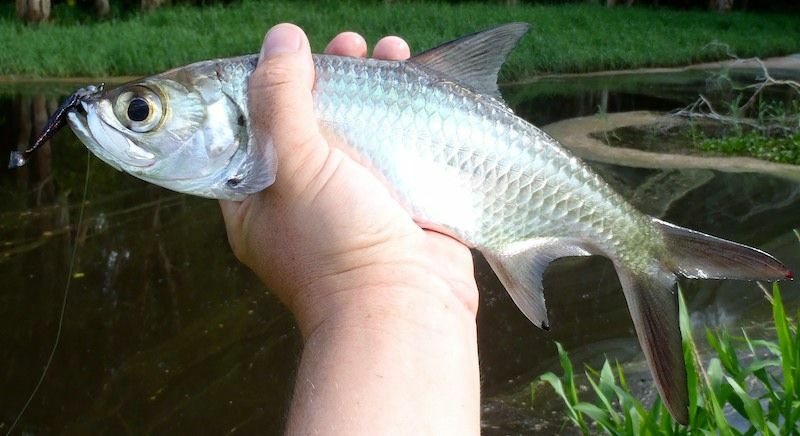 Tarpon are great sport, but no good on the table. I continued to fish a small River 2 Sea Bubble pop and got some good attention but no hookups. Then things went a bit quitet, so time for a change of tactics. 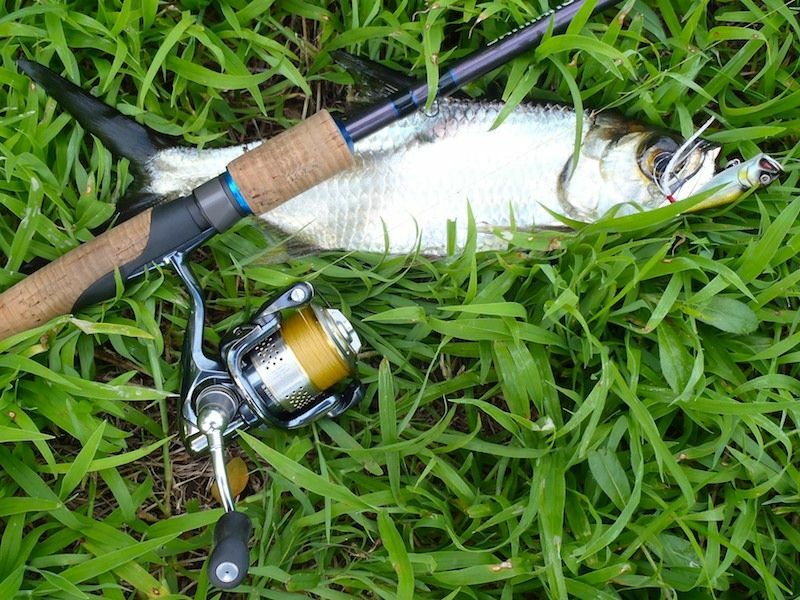 The Tarpon had been rising to the popper, but not reaching the surface. They seemed to be hanging deep. So I changed over to a small Squidgie Wriggler and light jig head to keep it down. This was a good move and soon 2 and 3 fish were having a go at it at the same time. I landed a few more, mainly small ones, and missed dozens of bumps that I'm guessing were from fish too small to find the hooks. Then things went quiet again. It was almost as though the fish were getting use to what we were throwing at them and loosing interest. Time for a new location and some bigger fish! As soon as we pulled up at our next location we could see BIG Tarpon tailing in the water. This was going to be good! My first cast and the popper was absolutely smashed in a shower of water, but no hook up. Next cast and I'm on. Some good jumps and we knew these fish were far better. In a difficult spot the fish threw the hook as I was lifting him out of the water and onto the bank. No matter, was to go back anyway. Meanwhile, Dave was now hooked up to his first at this location. 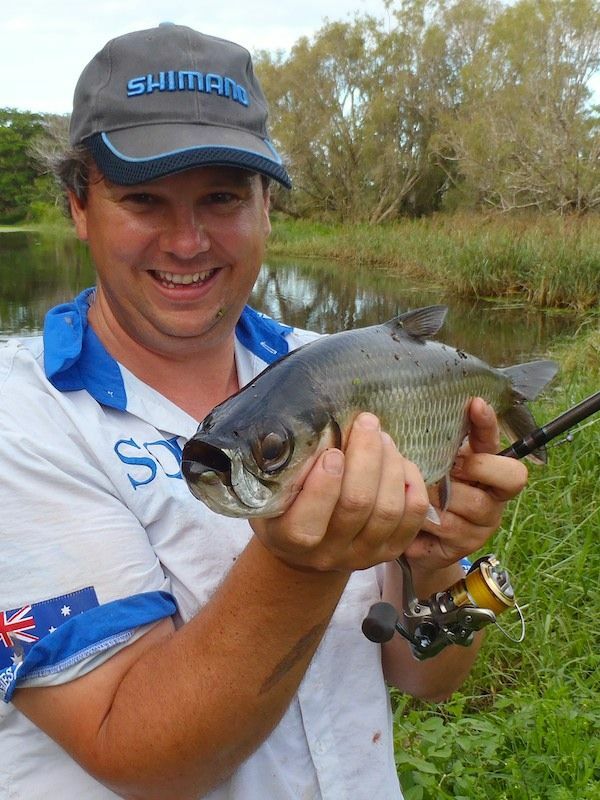 Another top fish that was giving him plenty of curry on the light fly rod. But Dave's skill soon had the fish on the bank. Photo and off again. Over the next hour or so we had a blast catching and releasing these fish. There were plenty of misses and crashing hits, and at least one stonker landed. We are so blessed here in the North to have such an excellent array of fishing opportunities available to us. 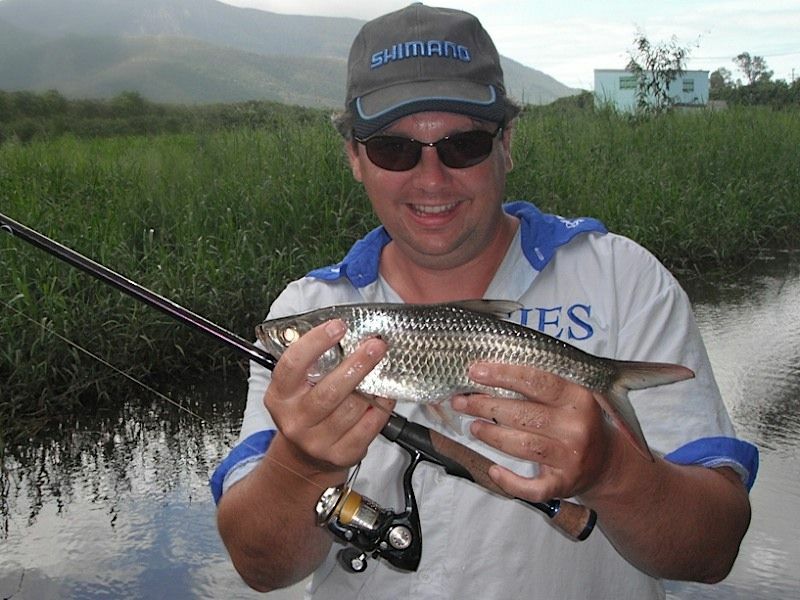 I was fishing with a River 2 Sea Bubble Pop 45mm on a Shimano Stella 1000fe and T-curve 661. And a Squidgie Wriggler on a Shimano Sustain 1000fe and T-curve 661. Both are spooled with 8lb Power Pro braided line and a 20lb mono leader. Tarpon are great sport on light line, and you could definitely fish a lot lighter than I was. A good leader is required as the fish have very rough mouths that will make short work of light line. 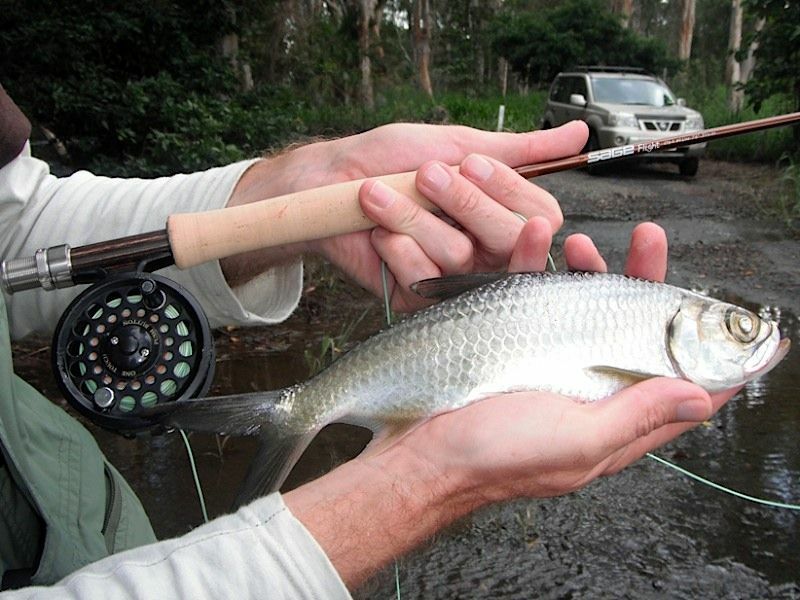 The 1000 size reals are spot on for these fish, providing light and nimble casting. I could cast the very light bubble pop a fair distance to the rising fish. 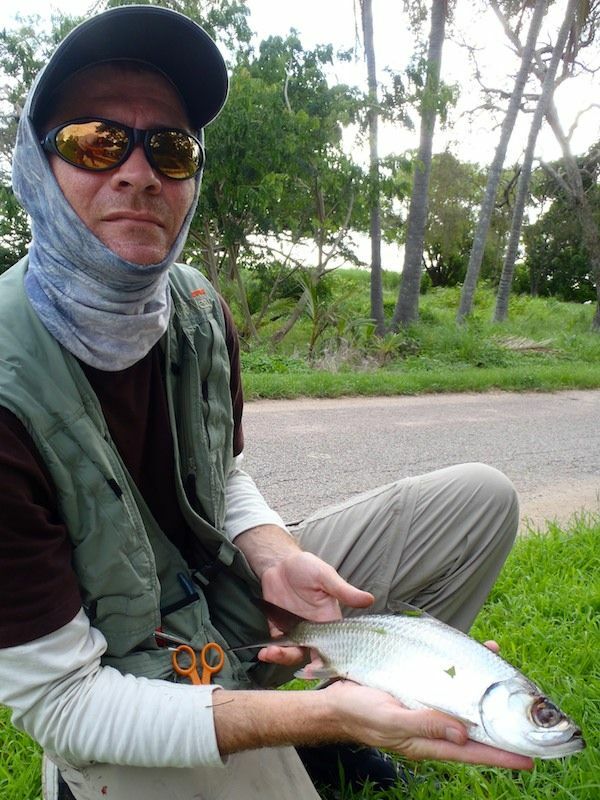 The technique with the Bubble Pop for Tarpon is not unlike what I would do for Barramundi when in season. That is, a couple of short but sharp pops followed by a 3sec pause, then repeat. The strike will almost always come during the 3sec pause. What I like about the Bubble Pop is that it has a bit of fly like material hanging off the back hook. This hangs really nicely in the water attracting the fish while its paused.